We have been blessed with a rather mild winter which helps with the trips we make. Now, spring seems to have sprung! Trees and flowers are blooming, birds are chirping and the furnace doesn’t come on as often. Praise the Lord! We have made several trips to the Flathead Reservation in Montana and to Celilo Village in Oregon. We’ve also been to Bob and Charlene Phillip’s church in Washington but I want to tell you about the HEART OF THE HELPER organization at St. Ignatius, Montana. 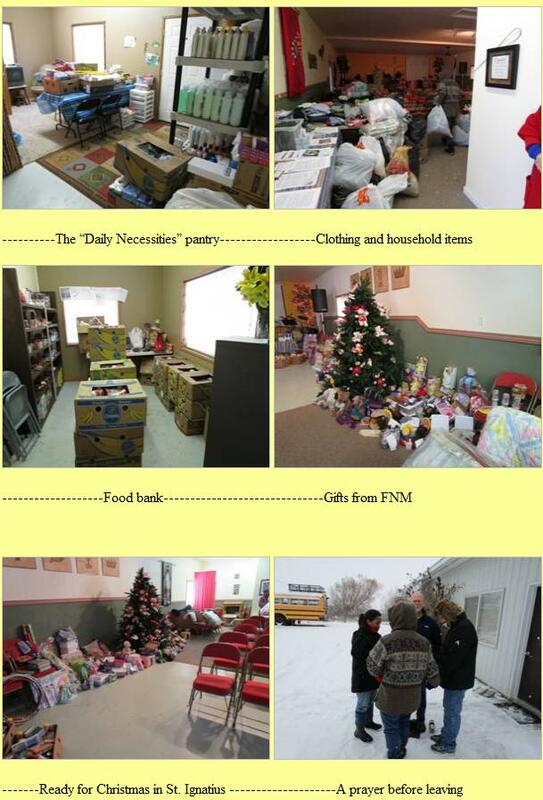 It is a non-profit ministry to the people of the Flathead Reservation that provides food, furniture, clothing, and health and beauty aids such as laundry soap, toothpaste/toothbrushes, and shampoo, at no charge. This daily necessity pantry is open twice a month and folks must enroll to receive. A small church, the MISSION MOUNTAIN WORSHIP CENTER, was challenged to step out on faith and try to help this economically challenged area. In their first year they didn’t know what to expect and thought if they reached 80 households (approximately 240 people) it would be wonderful. To their amazement, they served 179 households which is about 500 individuals and HEART OF THE HELPER was born. The church also felt to supply Bibles and so they formed another outreach called FLOODING OUR VALLEY WITH THE WORD OF GOD. In the first year they provided $2000.00 worth of Bibles to homes that didn’t have one. 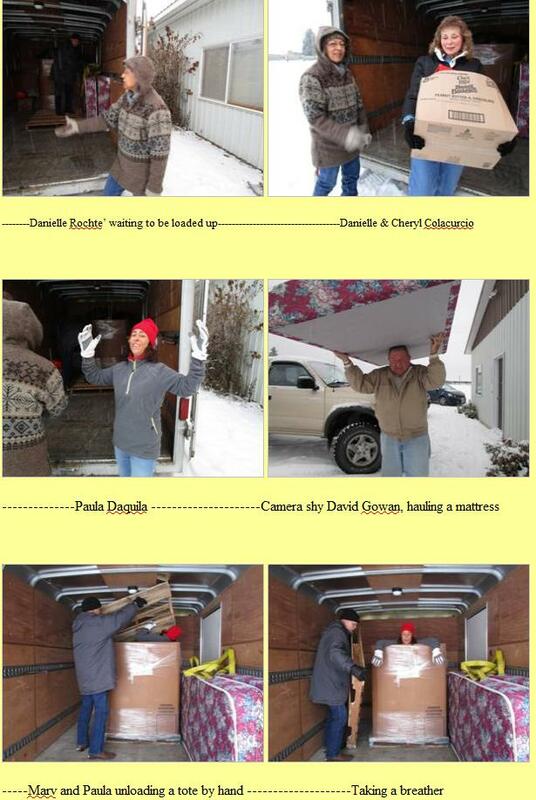 FIRST NATION MINISTRIES has been privileged to donate Bibles, food, furniture and Christmas gifts to help these fine folks do what they are called to do and we hope the partnership will continue for many years. Cheryl Colacurcio is the program director. I want to thank all you teammates who have made it possible for us to do what WE are called to do. You have blessed us and the First Americans that we help. Character cannot be developed in ease and quiet. Only through the experience of trial and suffering can the soul be strengthened; vision cleared; ambition inspired, and success achieved. George Mueller, the Prussian evangelist of the 1800’s said this, “Be assured if you walk with Him and look to Him, and expect help from Him, He will never fail you”. Amen, Mr. Mueller and Cheryl. The HOTH pantry is located in the MISSION MOUNTAIN WORSHIP CENTER on Highway 93 in St. Ignatius. This church, though small, decided to do what they could to help the reservation people, even though it meant stepping out of their comfort zone. With limited resources, and limited workers, God is surely blessing their efforts and we are thrilled to join with them and do what we can to reach some for Christ. As the old hymn says, “Little is much when God is in it”. We were happy to see Karen Jim Whitford and her husband, Fred, once again at Celilo. We have worked with them for several years now and it’s always a joy to take a load to their home. These faithful folks serve their village by handling the donations and Karen serves as the medical clinic for miner ills and injuries. We have helped supply the medicine chest. 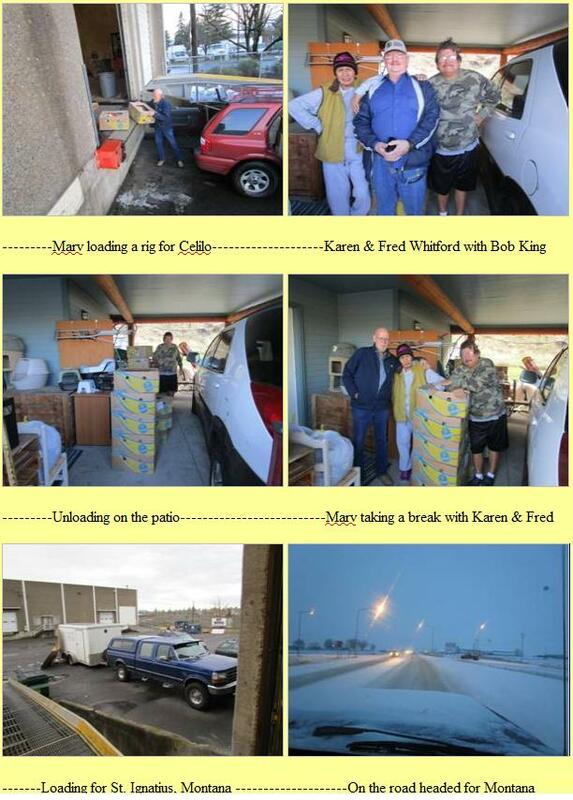 Our board member, Bob King, went with Marv on this trip to help with taking pictures, driving, and seeing old friends. Then it was back to Portland to get ready for a trip to St. Ignatius, Montana.